Austria has been criticised for moving too slowly to return works looted from Jews in the Nazi era. But now the country is facing criticism for returning a painting too hastily—and to the wrong Jewish family. Apple Tree II by Gustav Klimt was one of 300 works included in the exhibition Gustav Klimt: Artist of the Century at the Leopold Museum in Vienna (until 4 November) organised for the centennial of the artist’s death. It was loaned by the Fondation Louis Vuitton in Paris, established by the luxury goods mogul and art collector Bernard Arnault. On 22 June, the day the show opened, the Leopold Museum announced that it would not be showing the painting, saying in a statement: “Seeing as this artwork is currently the subject of a dispute between several people and institutions, which has not yet been resolved, the Leopold Museum has decided not to show the painting. The dispute was caused by the fact that while the painting was restituted by the Republic of Austria 18 years ago, it has recently transpired that a mistake was made with the decision to return this work.” The painting has since been returned to Arnault’s foundation. Part of the problem is due to a confusion of two paintings: Roses under Trees from 1905, and Apple Tree II from 1916. The first painting was the property of Viktor Zuckerkandl and part of the collection of the Purkersdorf Sanitorium in Vienna, a gathering place for Viennese literati. Klimt painted several portraits of Zuckerkandl’s wife, Amalie. When Zuckerhandl died, his niece Nora Stiasny inherited Roses under Trees, in 1927. The Nazis made an inventory of her family’s property in 1938, and Nora and her mother were killed in the Belzec death camp in 1942. Nora had tried to fund an escape from Austria by selling the picture to a Nazi official who had been a childhood friend. The official eventually bequeathed Roses under Trees to a girlfriend, who sold it in 1980 through the Swiss dealer Peter Nathan to the then-planned Musée d’Orsay in Paris, where it now hangs. Apple Tree II, the painting removed from Leopold show, first came to public attention when the prominent Jewish collector Serena Lederer lent it to an exhibition in 1926. After the Nazi annexation of Austria in 1938, the picture appeared on a list of Lederer’s property. Lederer died in 1943, and many of her family’s paintings were seized by the Nazis and later destroyed in 1945, when retreating German soldiers set fire to Schloss Immendorf, where the looted works were held. To complicate matters further, a provenance report from last year suggests that the Lederer family collection included two paintings with the title Apple Tree. 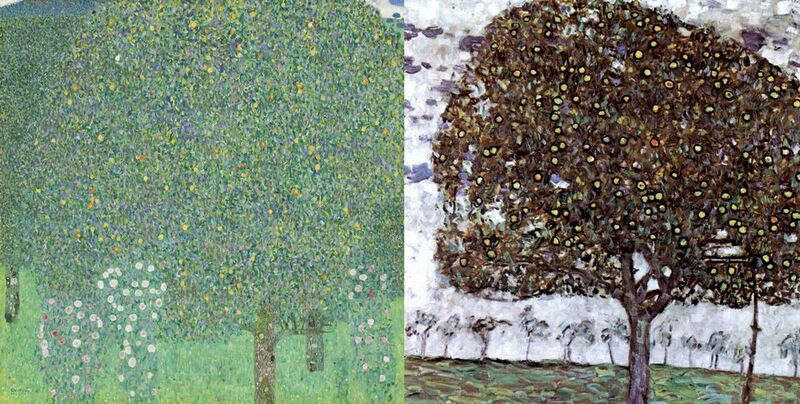 In 1961, Klimt’s Apple Tree II was donated, along with other Nazi-looted paintings, to Vienna’s Belvedere Gallery after the death of Gustav Ucicky, a former Nazi party member and director of propaganda films who some think was one of Klimt’s six illegitimate children. But some experts believe that a member of the Lederer family had sold the painting to Ucicky, raising doubts about whether it was actually looted. After a journalist raised doubts about Apple Tree II’s ownership, in 2001, Austria’s Art Restitution Advisory Board investigated and ruled that it had originally been the property of Nora Stiasny. The painting was returned to a surviving member of her family, Hermine Müller-Hoffmann. Hermine’s nephew, Viktor Hoffmann, who was living in Sweden, sold the picture, which was valued at a reported €20m. The current owner remained anonymous until it was revealed at the press preview for the Klimt show. The painting was removed from the exhibition the next day. Suspicions around the work’s provenance circulated even before it was handed over to Stiasny’s heirs, and experts called the mistaken restitution an “open secret” for years. In 2015, the Commission for Provenance Research found that the work owned by Nora Stiasny was actually Roses under Trees. But the Lederer family’s overtures to reclaim Apple Tree II were rejected last year by the fiscal procurator, which legally represents the Austrian government. It is not clear who is now liable for the wrongful restitution. The Austrian government is reviewing the legal implications of its decision, but has still not redressed its error. Documents cited by the Austrian press suggest that the heirs of Viktor Hoffman in Sweden might be liable if their former ownership is questioned. Since the painting was shipped out of Austria in June, the Lederer family’s options to recover the painting have become even more complicated. While Austrian art restitution specialists say they were surprised by the Arnault’s foundation’s willingness to loan the painting to the Leopold Museum, it is unclear how deeply he and his advisers looked into the provenance of a work that was restituted by the Austrian government. Reached in Vienna, Marianne Kirstein-Jacobs, the niece of the collector and philanthropist Erich Lederer, whose family owned the painting before Ucicky acquired it, said she still hoped to recover the work. “I am doing this only for my uncle, Erich Lederer, who died in 1985. We’ve been told that we have no rights, that restitution is a gift from Austria, but we will try.” The Foundation Louis Vuitton has not responded to requests for comment. The bigger question of whether Klimt’s Apple Tree II will be seen publicly again remains.